The tours that I talk about here are with Alcatraz Cruises. They are the official company that leads tours to the "rock", and are the only ferry service that are allowed to dock at the island. They also offer the lowest prices on Alcatraz tickets. This tour offers more independence. You are free to take as much (or as little) time as you want, but it is also the most crowded. There's a cool, eery atmosphere seeing the prison at night, and it's the most informative. It's (relatively!) less crowded, but there's more of a time crunch. This is a fairly action-packed 5.5 hour tour where you make stops at two different islands in the San Francisco bay. You see more in a relatively compact amount of time, but it's harder to go in depth with each place. Each of the tours offers a ferry ride to and from Alcatraz island, as well as a 45-minute, not-to-be-missed, audio tour of the Alcatraz Prison cellhouse. During the day, tours leave for Alcatraz roughly every half hour beginning at 9 am and continuing until 4 pm. The Early Bird tour is the first tour of the day, and typically sells out before any of the other day tours. The Early Bird tour allows you to get a slight head start, so that you have a chance to explore Alcatraz with fewer people. However, keep in mind that the following ferry arrives just 20 minutes later! You won't have the place to yourself for long! Once you arrive at the dock on Alcatraz, most people head up to the cellhouse for the audio tour. Afterwards, you are free to wander the island on your own until you feel ready to leave. Just make sure to give yourself enough time to catch the last ferry! This is Alcatraz's most popular tour, and frequently sells out weeks in advance. You'll get to see to see Alcatraz in the eery evening light, which adds to its mysteriousness, and if it's clear out, you'll have the benefit of seeing San Francisco's romantic city skyline all lit up. It is touted as a more intimate experience, which is true, but this is relative to the day tours. I've heard a rumor that the visitor cap at night is around 400, compared to 2000 visitors during the day! Personally narrated tour of the island's history on the ferry ride to Alcatraz. A guided tour from the dock up to the cellhouse. A 45-minute audio tour of the prison cellhouse. A sneak peek into areas of the the prison that are not open during the day. Plus extra video showings, programs and lectures. The schedule of programs is always changing, but when I was there they offered a lecture about the most successful attempt to escape from Alcatraz (which I can highly recommend), as well as a re-creation of the prison night-time lockdown. Unlike the Alcatraz tours during the day, if you are interested in any of the extra programs, you will not have time to explore other parts of the island on your own. I personally didn't have more than 5 minutes to browse the gift shop, and there were parts of the island that I didn't have time to see at all. That said, it was definitely still a great visit! TIP! 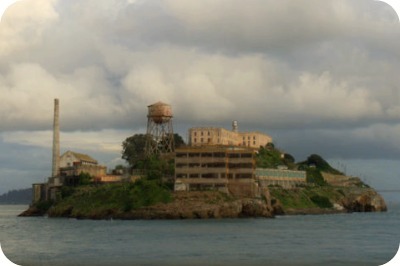 During the summer season, there are two evening Alcatraz tours offered. If you can, definitely try to catch the earlier of the two to allow yourself more time to wander around. This tour might be a good choice for you if you don't have a lot of time in San Francisco, and you really want to see both of these islands. That said, I have a hard time recommending it, because it doesn't give you much time to linger in either place. Angel Island is big enough that you could easily spend a full day exploring it. If you have the time, it might be worthwhile to visit the two islands in separate trips. Angel Island is a good place for people who enjoy spending time outdoors. It's a state park, and there are trails for both hiking and biking. There are various little beach coves to tuck into, and on a clear day, the wonderful panoramic views are hard to beat. It also has a rich history. Between 1910-1930 it served as an immigration processing point, and is sometimes referred to as the West Coast's version of Ellis Island. A tram or a Segway tour will inform you of the historical sites in the park, or you can explore them on your own. Of the different Alcatraz tours, this one tends to sell out last. The Prison Cellhouse Audio Tour (which is included with all the tours) is fantastic, and I highly recommend listening to it! It's about 45-minutes long and made up of interviews with former prison inmates and correctional officers who were there during it's federal penitentiary days. It does an incredible job of giving you a sense of what it was like during that time. The audio tour is offered in the following languages: English, Spanish, German, French, Italian, Japanese, Dutch, Mandarin, Portugese and Korean. TIP! To avoid shuffling through the prison cellhouse together with a crowd of people, try to time when you press "play" on your audio tour for a few minutes after everyone else has started. This will allow you to wander through the prison with a little less competition for space.